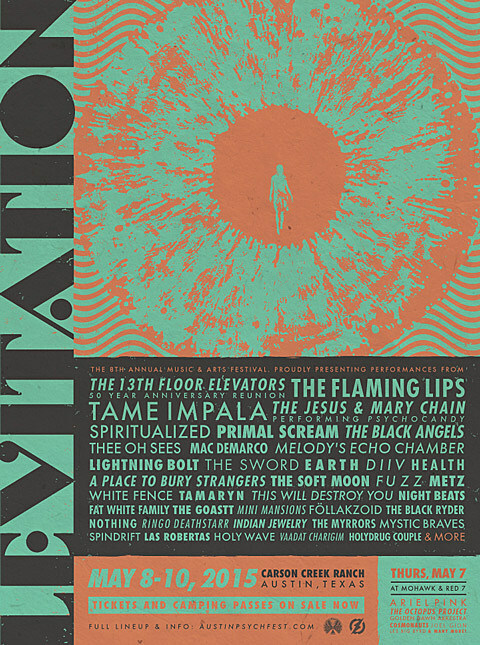 Levitation, the festival formerly known as Austin Psych Fest, has announced the final lineup for the 2015 edition which happens May 8-10 at Carson Creek Ranch. Eight bands have been added: Holydrug Couple, Creepoid, Ex Cult, The Well, Tele Novell, Dallas Acid, Ryan Sambol, and Baby Robots. A couple bands have dropped off as well: Australian band Krakatau can’t make it due to travel complications, and Seattle’s Rose Windows broke up. Check out the whole awesome lineup here — schedule will be posted next week. Tickets are still available. Levitation will also have a Campground Stage this year featuring performances by Gourisankar Karmakar & Indrajit Banerjee, New Fumes, Cloudland Canyon, RelaxerThousand Foot Whale Claw, Silent Land Time Machine, Symbol, Amerikan Bear, Burning Palms, Dyn, Sans Soleil•Airplane Mode, (Some) Flowers Of Hell, Texas Bob Juarez, Michael Garfield, and more. Details on that and the campgrounds are here. Meanwhile, Levitation is presenting a show on Saturday (4/18) at Mohawk with Whirr, Holy Wave, Christian Bland & The Revelators, Tele Novella, Wild Moth, Moving Panoramas, Pollen RX, and Cross Record at Mohawk. Tickets are on sale.